For more than a thousand years, the minaret of the Aleppo’s Great Mosque towered over the old city. Standing over the reputed burial place of John the Baptist’s father, the ancient structure had long withstood the test of time, enduring countless natural disasters and foreign invaders. But amid heavy fighting last month, an explosion rocked the mosque complex and a thousand years of history came toppling down. The minaret, regarded as an architectural masterpiece, was no more. Sadly, this is not an isolated incident. The Syrian civil war has gone on for more than two years. In that time, fighting between rebels and government forces loyal to Bashar al-Assad have claimed the lives of at least 80,000 Syrians. But there is more than a human cost to the ongoing conflict. Syria has been a crossroads of religion and culture for millennia and some of the earliest human societies emerged from its fertile plains. Damascus, once center of the mighty Umayyad caliphate, is one of the longest continuously inhabited sites in the world. With magnificent cities such as Palmyra and Antioch straddling some of the richest trade routes of the time, the region was a key province of the Roman Empire. The Apostle Paul famously converted to Christianity on the road to Damascus and some of the country’s mosques have been in use since the time of Muhammad. Six sites have been named UNESCO World Heritage Sites. But with the conflict between rebels and government forces escalating, Syria’s rich cultural and archeological heritage is increasingly vulnerable to destruction. Normally, Syria’s Directorate General of Antiquities and Museums oversees the maintenance and preservation of its archeological heritage. In peacetime, its efforts have been relatively successful. But since unrest began in 2011, the DGAM’s ability to carry out its mission has been increasingly compromised. It is difficult to ascertain the level of damage inflicted on Syria’s cultural and archeological sites, but scattered reports suggest wanton destruction of archeological and cultural sites reminiscent of the losses suffered by Iraq in the chaos following Saddam Hussein’s overthrow. Like in Iraq after the U.S. invasion, looters are taking advantage of the breakdown of order to pillage archeological sites and museums and selling artifacts on the black market. Meanwhile, several sites of cultural value have become battlegrounds between rebels and government forces. Syria’s largest city, Aleppo, is home to an Old City that UNESCO added to its World Heritage list in 1986 in recognition for its “rare and authentic Arab styles.” Until two years ago, it was a living museum. Now it has become a battleground, with rebels and government forces fighting for every inch of territory. The Citadel of Aleppo, a medieval fortress, sustained shelling and has since become a staging ground for Syrian troops. In its heyday, the Al-Madina souq, or open-air market, was a bustling trading hub on the Silk Road. Now the market, the largest of its kind in the world, is a ruin, consumed by fire amid skirmishes between rebels and loyalists in 2012. Hardly any part of the old city has been left untouched by the fighting, a somber occurrence repeated all too often in the rest of Syria. Another World Heritage Site caught in the crosshairs of the Syria conflict is the famous fortress Kraks de Chevalier, the former headquarters of the Knights Hospitallers during the Crusades and one of the world’s best-preserved military castles. In an interview by PRI’s The World, Boston University Assistant Professor of Archeology Michael Danti revealed that the site has sustained shelling damage during an attempt by government forces to dislodge rebels stationed inside the castle. A video by rebel forces shows extensive damage on the castle’s battlements. The Ancient Villages of Northern Syria, a collection of Christian Byzantine villages dating from the 1st to 7th centuries, has also seen better days. Just recently designated a World Heritage Site in 2011, the area contains some of the most well preserved indicators of Christian lifestyle prior to the arrival of Islam. Among its more prominent ruins are the remains of the Church of St. Simeon Stylites, the oldest surviving Byzantine church. Since the Syrian conflict began, there are scattered reports indicating that the area’s ruins have suffered extensive harm. Images and video stills from a report made by the Global Heritage Fund reveal graffiti, shell damage and bullet holes on several ruins. Meanwhile, refugees driven from their homes by heavy fighting have turned many of the ruins into temporary shelters. Elsewhere, the 5,000 year-old remains of the ancient city-state of Ebla once provided archeologists with insight on one of the earliest Syrian civilizations. In the 1960s and 1970s, archeological excavations unveiled the city archive, a treasure trove of stone tablets inscribed with Sumerian script that shed light on daily life in the city. Later excavations continued to reveal valuable information. But according to a piece by the New York Times, once the civil war began, rebels began using the site as a watch post for spotting incoming government planes. Already, the site is deteriorating from increased traffic, damage and theft. Northeast of Damascus lie the ruins of the ancient city of Palmyra. At its height during the 1st and 2nd centuries, the city was Rome’s jewel in the East. Its splendor so impressed Emperor Hadrian during his visit in 129 CE that he renamed it Palmyra Hadriana and bestowed free city status upon it. The city remains include examples of Greco-Roman art and architecture combined with local influences, the most impressive of which is the Temple of Bel, a magnificent structure that was the center of religious life in the city. Beginning in February of last year, government forces laid siege to the city, occupying the citadel overlooking the ruins and shooting at anything that moved below. 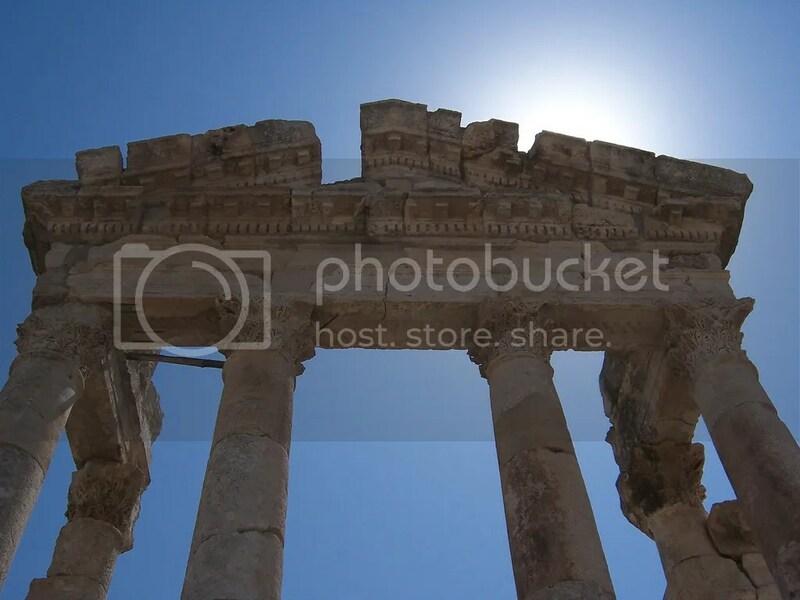 A video by a local shows shrapnel damage to the Temple of Bel’s colonnade, while another video purportedly shows government troops pillaging artifacts from the ruins. The list of cultural and archeological sites threatened by the Syrian conflict is endless. Because of lack of access, the true extent of damages will not be known for some time. According to the Humanitarian Unit of the State Department, 97 percent of Syria’s heritage sites are inside areas of conflict and displacement. If events continue as they are now, Syria will experience a devastating and irreplaceable cultural loss. Since March of last year, UNESCO has been appealing for the protection of Syria’s heritage. But it is up to Syrians themselves to take upon the task of preserving their cultural heritage. For the Syrian people, these ruins and artifacts are their history. They tell them not only where they come from but also what they can become tomorrow. The losses in Syria may go quietly today, but their absence will be mourned for centuries to come.